Line L in New York's subway (Canarsie line, former BMT), for the class R-143 subway train. The line goes from Rockaway Parkway in Brooklyn to 8th Avenue on Manhattan. Announcements of stations and connecting lines. Nice landscape details outdoors. The creators of the line have made an effort to get the signal aspects to look like they do in real life. Few trackside details and details at stations. 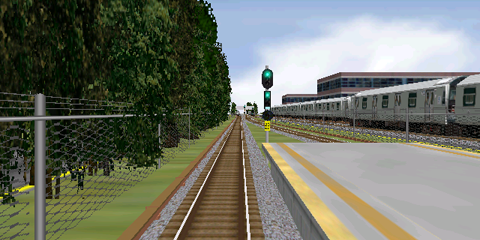 This line uses graphical objects from the NYCTA E line, which must be installed before this line can be used. The graphic objects for class R-143 trains are not shown properly.